Hanging parrot toy with hard paper ring attached with plastic foraging cups for medium to large bird such as cockatiel, conure, quaker, senegal, caique, ringneck, amazon, african grey, cockatoo, etc. 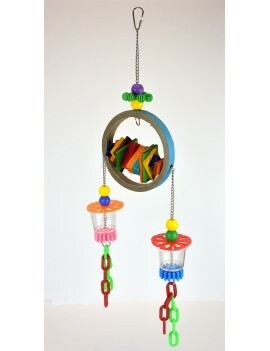 - Hanging parrot toy with hard paper ring attached with plastic foraging cups. 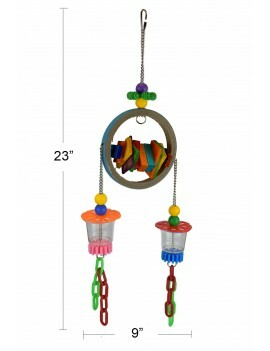 - The bird toy is suitable for medium to large bird such as cockatiel, conure, quaker, senegal, caique, ringneck, amazon, african grey, cockatoo, etc.